In case your iPhone or iPad is flooded with Photos, you may want to free up storage space on your device by getting rid of all the Photos. 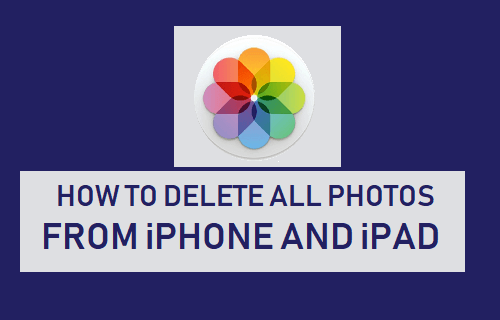 You will find below different methods to Delete All photos From iPhone or iPad. While it is really tempting to shoot Photos on iPhone or iPad, the number of Photos that can be stored on your device is limited by its storage capacity. When the iPhone is nearing the end of its storage capacity, most users free up storage space on iPhone by manually deleting unwanted Photos. However, going through hundreds of photos and deleting them manually is a frustratingly slow process. A better option is to download all the Photos from iPhone to Mac or PC and bulk delete all Photos on iPhone. You will find below different methods to delete all photos on iPhone, you can use any method that you find easy to follow. There is no “Select All” or “Delete All” option in iOS. 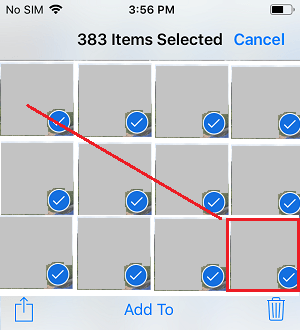 However, it is still possible to select hundreds of Photos on iPhone using a workaround as provided below. Note: It takes a bit of practice to get used to selecting multiple Photos on iPhone using the workaround as described below. 1. 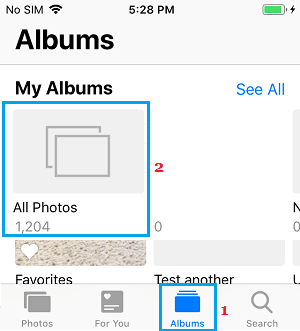 Open the Photos App on iPhone and tap on Albums tab located in the bottom menu. 3. Once you are in All Photos, tap on the Select button located at the upper right corner of your screen. 4. Once you are in All Photos, scroll down to the end and drag your finger from the Last Photo towards the diagonal opposite edge of the screen (as shown in image below). Keep your finger pressed at the diagonal edge of the screen, as more Photos continue to be selected. If this action is performed correctly, you will see multiple Photos being continuously selected and check mark appearing against the selected photos. Continue to hold your finger at the diagonal upper edge of the screen, until all the Photos are selected. 5. Once all photos are selected, tap on the Trash can icon located at the bottom of your screen. 6. Next, you will see a confirmation pop-up, tap on Delete to delete all the selected Photos from your iPhone. 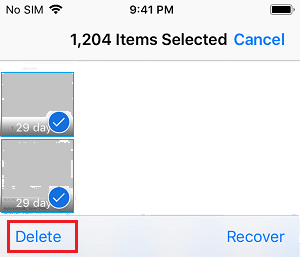 Note: Your iPhone may appear as stuck if you select and delete more than 1,000 photos. Give your device enough time to delete the Photos. 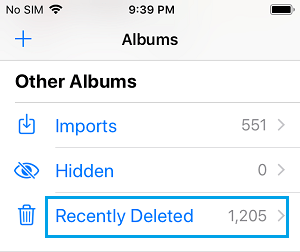 Although you have deleted All Photos from iPhone, the deleted Photos will still be available in Deleted Photos Album, until they are deleted by the system after 30 to 40 days. If you are trying to clear up storage space, you will have to delete the Photos from Recently Deleted Album. 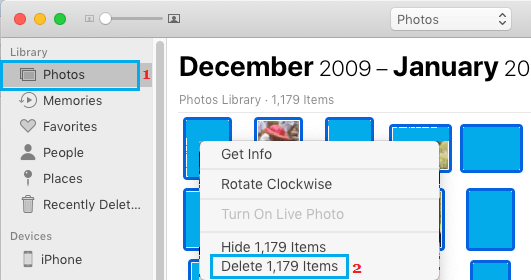 Open Photos App > tab on Albums > tap on Recently Deleted. 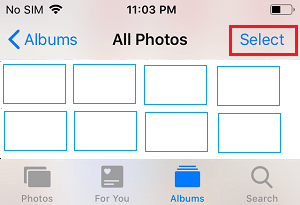 Once you are in Recently Deleted Album, use the diagonal scroll trick to select All Photos and tap on Delete to permanently delete All Photos from iPhone. On the Confirmation pop-up, tap on Delete to permanently delete All the Photos from your iPhone. The easiest way to Backup and Delete All Photos from iPhone is by using the Image Capture Utility as available on your Mac. 1. Plug your iPhone into the USB Port of Mac. 2. Click on the Finder icon in the Dock of your Mac. 3. Next, click on Applications in the side menu and double click on Image Capture App. 4. Once the Image Capture App is Launched, click on your iPhone and you will see all the Photos on your iPhone appearing in the right pane. 5. To Backup All iPhone Photos to a Folder on Desktop, click on the Import All button. Once you click on Import All, Image Capture Utility will automatically create a Folder with the Name of your iPhone and start importing All the Photos on iPhone into this Folder. Note: You can also choose other destination for the imported Photos by clicking on the Down-arrow next to Desktop. After All the Photos from iPhone are downloaded to Mac, you safely Delete All Photos on iPhone. 6. To Bulk Delete All Photos on iPhone, press Command + A keys on the keyboard of your Mac to select all the Photos available on your iPhone. Once All Photos are selected, right-click on any selected Photo and click on the Delete option. 7. On the Pop-up, click on Confirm to begin the process of deleting all the Photos located on your iPhone. If you have enabled iCloud Photos on your iPhone, you will be able to access these Photos on your Mac and delete them. 3. In the Photos App, switch to Photos View. 4. Once you are in Photos, press Command + A Keys to select All the Photos. Once All the Photos are selected, right-click on any Photo and click on Delete option in the menu that appears. 5. On the pop-up, confirm that you do want to Delete All Photos on iPhone. As mentioned above, the deleted Photos will still be available in Recently Deleted Album. You can either leave them to be deleted later on by the system (in 30 to 40 days) or delete them right now by going to Recently Deleted Folder. Click on Recently Deleted > Press Command + A to select All Photos > right-click on any selected Photo and click on Delete option. 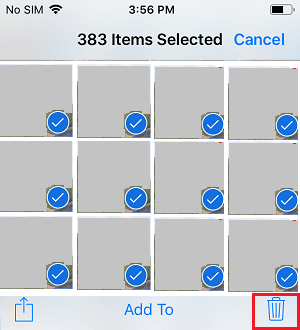 This will permanently delete all the photos from your iPhone and free up storage space on your device.